The Hite Art Institute is pleased to announce the 2019 Spring BFA Thesis Exhibition. The exhibition will display artwork in a variety of mediums from students graduating with a Bachelor of Fine Arts from the University of Louisville's Hite Art Institute. Please join us on Thursday April 11, from 5-7 pm to celebrate with the graduating students during the opening reception of the exhibit. Refreshments will be served. 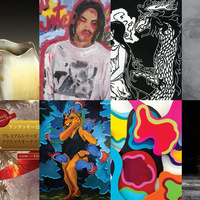 Students participating in the 2019 BFA thesis exhibit include: Logan Bishop, Francis Dumstorf, Lililan Fouch, Kt Green, Kellise Hoefer, Olivia Lantz, Courtland Mead, Jordyn Oswald, Olivia Pike, and Kristin Powell.